On your Mark………..Get Set……..(Pokemon) GO! In the last month, the world was introduced and subsequently gripped by the ‘Pokemon GO’ phenomenon. It was split between the augmented reality players who walked around with their eyes glued to their smartphones, and the bemused others camp who scratched their heads wondering what to make of it all. Putting aside for a second which camp you identify with, SMEs (particularly those in the hospitality sector) saw this as an opportunity to drive customers into their operation by embracing the players and offering discounts to them, and some even made their businesses ‘PokeStops’ or ‘Pokemon Gyms’. This early identification of an opportunity, coupled with the speed to act and monetise a trend highlights the fundamental difference between SMEs and the rest of the business sector. SMEs possess an agility and speed to market that big corporates just cannot match. We here at Archery Capital not only wish to emulate their agility, but we also salute those early adopters who set the pace for the rest of the business community, and once we figure just what a ‘Pokemon’ is, we hope to join you in the hunt! Last week the Reserve Bank of Australia chose to cut its cash rate by 25 basis points to a record low of 1.5%. The interesting response from the banking sector was to offer a partial rate cut, coupled with an increase in its term deposit rates. Our take on this is that the rate cut was not fully passed on for two reasons. Firstly, as the Treasurer has already confirmed, there does not appear to be a cost of funds issue that he is aware of that might have contributed to the rate cut not being passed on in full. It is therefore a reasonable assumption that the banking sector whilst looking to appear to shore up its long-time suffering term-deposit customers who have been starved of higher returns, are actually protecting their margins. This strategy has been deployed due to the uncertainty that still nags markets globally, and arguably to shareholders, it is good economic management. By being prudent, the banks will undoubtedly be better positioned if and when that rainy day does eventually show up. Secondly, the last rate cut that was passed on in full by all but one of the ‘Big 4’ Banks happened in May this year. At that time the election was looming and the rumblings of a Royal Commission into the Banking sector was still a white hot issue. This time around the banks clearly misread the tea leaves that the threat of a Royal Commission had passed, and chose accordingly to keep the bulk of the cut for themselves. From the outrage that followed their decision, and with the fact that politicians of all stripes will be closely seeing how much momentum this gets from the electorate (particularly now that bank reporting season has arrived with bumper profits expected), we believe that this was probably a misstep by the banks, and one in which they will hoping to ride out in the next few months. This issue is clearly far from over! The Election is over (we think), but why is the Small Business Portfolio out of Cabinet? The new look ministry was announced by the Prime Minister following the election result being finally finalised. Michael McCormack replaced Kelly O’Dwyer as the Small Business Minister, but the actual Small Business Portfolio failed to make the cut into Cabinet. Various representative bodies for this sector voiced their disappointment and concern, and the Prime Minister’s response was that every Minister was a Minister for Small Business! It is however difficult to believe that given the air time that Small Business received during the election campaign that anyone foresaw this demotion as a possibility. The usual post-mortem into the reasons behind this oversight began in an attempt to understand it. At Archery Capital we believe that it was a lot simpler than this………they just forgot! In the nail biting finish that culminated in the Coalition scraping the numbers to form Cabinet, it could have been nothing more than mere relief and elation that contributed to this oversight. Our view however, is that this does not need to end up being a bad thing for the sector. By its absence in Cabinet, the Small Business sector is now much more conspicuous. Further, following the circus around Census, Minister McCormack will be clearly distracted, and the representative bodies of the Small Business sector can indeed hold the government to account on every Minister truly being a Minister for Small Business, while Minister McCormack deals with the Census debacle! In July we were approached by a borrower who had found new commercial premises for his business after searching for more than a year. He was in the process of obtaining finance from his bank when he was contacted by the real estate agent who advised that another interested party was showing up with a bank cheque in three days to take the property off the market, and the auction was going to be cancelled. The borrower contacted his bank, and was told that they could assist him, but it would take more than a week. The borrower then spoke to his broker who put him in contact with us. We were able to provide him with the funds in three days, and he was able to secure the property. His bank will take out our position in a few weeks when his application is finally processed. He was suitably impressed, and will be using us for all his future short-term funding needs. Upcoming Events: Western Australia official launch! As the WA state economy transitions, it is apparent that its SME sector is under threat from receiving viable and reliable financial support from nervous traditional financiers as they themselves transition their businesses. At Archery Capital we have listened to the feedback from our WA audience, and will be having a launch event in Perth commencing at 5.30pm on Tuesday, 16 August 2016 at 10/111 St George’s Terrance. For those in WA who are interested in coming and meeting us, please contact us so that we can add you to the list of attendees. 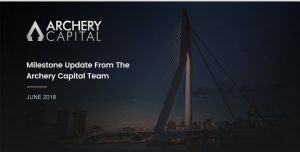 As promised in our last bulletin, Archery Capital will always aim to innovate consistently and improve our offering based on our stakeholder feedback. In this spirit, we own the fact that our first website did not hit the mark. Even though it was not quite as disastrous as the Census Website, we have nevertheless pressed the restart button on it. Finally, as always, please feel free to contact us for a discussion on anything you believe we might be able to help you or your clients with. 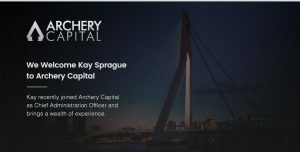 In addition to our new website, don’t forget to follow us on Twitter @ArcheryCapital and on LinkedIn – Archery Capital Pty Ltd.